After taking on all most all of the US service providers on board, Samsung Galaxy S IV is now available on Cricket Wireless in the US. Cricket Wireless has started taking pre-orders for the Samsung Galaxy S4 with an expected shipping date of June 7th and its is offering a instant discount of $125.00 for those booking the phone now. So if you are interested, book your brand new SIV now on the Cricket Wireless website. The S IV ships in two colours, black and white. However do note that Cricket Wireless is not available is some parts of United States. Cricket Wireless is a pre-paid carrier that operates partially on the networks run by Sprint, MetroPCS, etc. But remember that Cricket may not be available in your area or it may not offer the S IV in your area. You will have to enter your ZIP code to find out whether Cricket Wireless is available in your area. 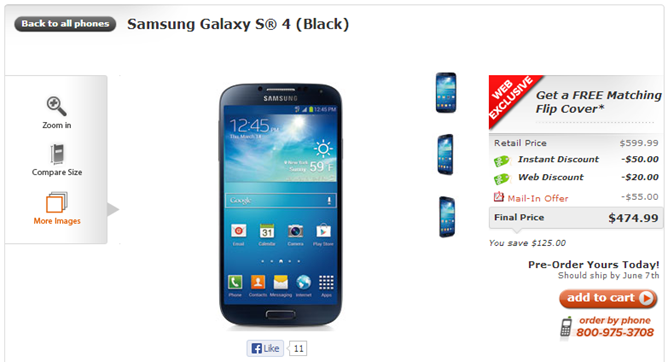 Samsung Galaxy S IV seems cheaper if brought upfront at $474.99 and it ships with a free flip cover. The monthly plan rates are $50.00 for 1GB option and $60.00 for the 2.5GB option.